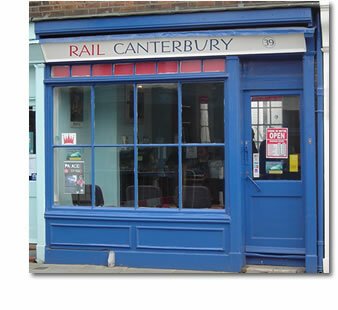 Rail Canterbury is a specialist in European Rail Travel and can provide tickets and reservations for virtually any destination in Mainland Europe. With a combined total of more than 60 years experience in this field, Phil, Jacky, and Nicky will be happy to help you with all your travel requirements. We are located at 39 Palace Street in Canterbury, Kent, which is approximately 10 minutes walk from either Canterbury West or Canterbury East railway stations. With ample car park space nearby, we can also welcome visitors coming by car. If you are not able to visit us in person, we can help you by phone, fax or e-mail. The following pages are designed to help you with preliminary details but if your requirements are more specific then please do contact us and we will be able to provide you with more information.